I’m sure this change back to snow routes won’t confuse anyone……..not! I’m sure he will still find something to rant about…..
All we need to do is remind Jason of all the years of wonderful radio entertainment- is Dave Ross even around anymore?- that abandoned us for him! I normally am not a fan of Rantz. I usually find his rage to be made up and contrived. I also just got back from a short walk in the hood with my wife. We ran into a neighbor who was totally confused about what the end of the ESN meant. We had to set him straight. Earlier this week both he and my wife waited for an hour at a bus stop and the bus never came. They shared an Uber to get DT. His company paid. The 4 young renters next door have also mainly been taking Uber. This is not the way things should be. He’s right that Metro’s communication about reroutes is not very effective. How much Metro can do about it and what approach it should use is another question. It must be hard to coordinate hundreds of buses and drivers when road conditions are constantly changing, much less get to-the-minute changes out to customers, some of whom have smartphones and are likely to check websites and some who aren’t. 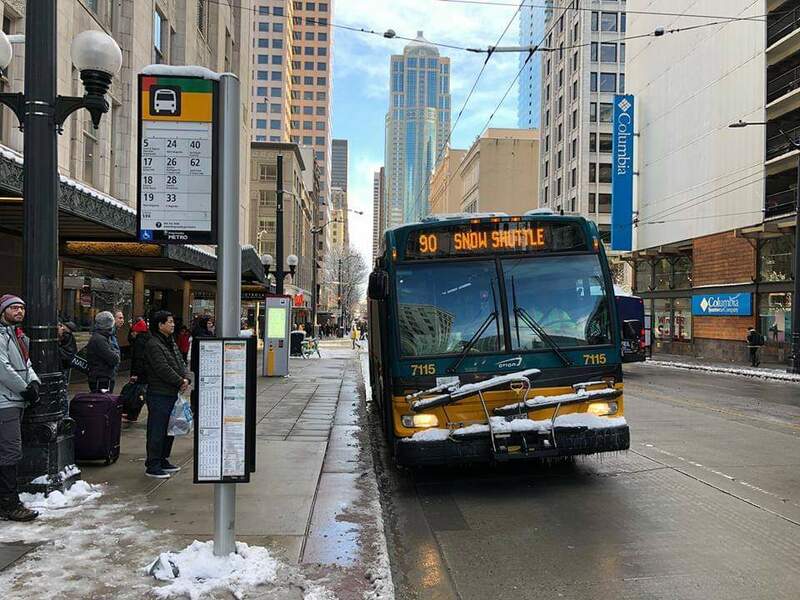 The idea of posting a sign at every bus stop is not realistic: there are thousands of bus stops, and the workers would have a hard time even getting to some of them (because it’s snow), much less changing the sign immediately when the bus goes on or off snow route or switches to an unpublished snow route. I saw a 10 at Pine & Broadway on Sunday and felt for any people who were waiting for it on John Street. That happened to me the last year it snowed when I was waiting for a 75 at UW Station and a couple 65s came but no 75, so I took a 65 to U Village and then came a 75 through campus on its regular route. What’s wrong with putting a little snowflake sticker with associated route numbers that serve that stop during snow routes on the signs? At stops that receive no service during the snow, a snowflake with the “NO” symbol superimposed on it could be used (I think CT does this now) – if some routes use a stop and some don’t during snow re-routes, both could be used with their corresponding route numbers. Then someone waiting for that 10 on John would see that the 10 does not serve that stop during snow re-routes and at the very least they’d know to look it up or ask someone who could or who might know. This doesn’t solve all problems of course, because people still need to get the correct information somehow – but it does tell people that something is different and, particularly, that there is no point in waiting where they are forever. Interesting reading what it’s like for a infrequent rider like Jason Rantz trying to take Metro on a snow day. ANTI-TRANSIT BLOG WRITER TRIES TO TAKE BUS IN WORST WINTER STORM IN DECADES WITHOUT EVEN ATTEMPTING BASIC RESEARCH; HAS BAD TIME. I wonder if he also tried to drive around Seattle without checking the plowing priority map and then complained because some side street was covered in snow. RapidRider, your comment doesn’t reflect poorly on Jason, it reflects poorly on you. It sounds like you either didn’t read the story and are being dishonest having done so, or you have poor reading comprehension. Jason did research. It’s in the story. I’m glad that Sam understands we need more funding for transit, so it better serves people during winter storms. I don’t think the winter network is a transit funding problem, unless you want KCM to pay for more snow plows? Metro spent the weekend operating their Emergency Snow Network (ESN) – meaning, they’ll operate the major routes, but that’s about it. And you’ll only know this if you happen to go to their clunky website or follow them on Twitter, two things only transit nerds regularly do. I mean, he admits right there that he attempted to take the bus during a major winter storm without even bothering to look at the website. I don’t care how clunky it is or that only “transit nerds” visit it: when it snows and you want to take the bus, check the website, that’s common sense. Does he also drive his kids to school in the snow without checking the school’s website to see if school is canceled? Instead, he shows up at normal stop without bothering to do that, expecting his normal bus to be on time and then gets pissy when his bus doesn’t show up. I have zero sympathy for him and stopped taking his article seriously at that point. That’s all fine and good, because the rest of his article is just pathetic whining about homeless people, some woman who didn’t get his joke, a piece of garbage on the bus (apparently he expects the driver to keep the bus clean while driving?) and other things I admittedly glazed over, especially the part where he considers himself a hero for being nice to people. He does go out of his way to end the article with a pot shot at Metro about how they don’t care about “care about me or you as a customer” and that only “anti-car, urbanist extremists” actually like Metro. Standard filth that I would expect from MyNW blog articles that read like they were written by a hormonal teenage boy who just got turned down for the prom. Again, he admits in the opening paragraph that he did no research and it absolutely reflects poorly on Jason, but his rabid commentors don’t care, as long as he fulfills their confirmation bias. Does that sound about right, Sam or do I need to work further on my reading comprehension skills? Jason checked Metro’s twitter page. He checked a Metro blog post. He repeatedly checked their website. He looked at the ESN page and snow route map. He checked OBA. He talked to, and asked other passengers. He talked to bus drivers. You said he didn’t do basic research. He did more research than most. Good job, RapidRider — nailed it. Does anyone know whether the Route 62 Snow Shuttle was signed as a Route 62, or something else? I have a friend who was thinking of taking it and saw a bus just labeled “snow shuttle” and going the opposite direction of the supposed Route 62 Snow Shuttle (northbound on Montlake rather than southbound), so ended up taking the 65 instead. If something just says snow shuttle, you have to ask the driver which route they are. And the 62 on snow route doesn’t go north on Montlake, only south. This is not at all clear. on the route 62 map. Metro gets a B minus for this lackluster performance. Route 62 has everyone confused right now. I’ve been dealing with that the last 1.5 hours now. Nobody understands the ESN. “Snow Shuttle” is Route 90. As far as I know, no other routes had this exact signage on their ticker. So….if you go to the King County main page and search on route “90”, nothing shows up. The route does not exist as far as KC is concerned. See how people can get confused? Or did you mean something other than “90”? It only exists during the ESN. So….if the ESN is active, and you go to the main King County webpage, and then you search on an ESN route, that webpage won’t show you that ESN route, because the ESN is active? Do you see why people might be having a bit of trouble with this? And I’m sorry, but if I’m looking for real time Metro route information, I’m not really in the habit of going to Wikipedia. That is not where I am used to getting my route info. It’s not even an official Metro website. I think, that when this is storm is over and Metro is back to fully normal operations, either the King County Council or the Seattle City Council (and/or both) need to launch an open and transparent investigation into what Metro did right and what Metro did wrong. Because if this region intends to move more people from SOV’s to transit, then it is really mandatory that the transit providers improve things on their end too. We just can’t have a repeat of this ESN mess. There are also two alert lists on the website, one with current information and the other with pre-snow long-term information. That’s confusing, especially if you have a bookmark to a routes page that has a link to the regular alerts list. “Let’s see, I know I’m supposed to check the alerts list to see about any reroutes, and here’s an Alerts link.’ You have to know to go into the “Metro Winter” section to find the special alerts list. Even different announcement panels have a link to one list, the other list, or a Not Found page, so you have to be lucky about which announcement you see and respond to. Some routes just say Shuttle. I’m not sure how widespread it is, but I saw a bus laying over at UW Station with just the word Shuttle. I don’t know if it added a number when it started moving. I looked in the windshield for a sign because that’s what the buses used to do when they had a short route that wasn’t preprogrammed into the signs. I didn’t see one but I was across the street so I couldn’t see closely. One feature I’ve seen on a couple routes today is “# Destination 1, Destination 2, Snow Route”. That’s a nice feature. It goes along with the “Metro Hiring” message it has added to some buses. I know that the Rapid Ride C had a shuttle going south from the Alaska Junction in West Seattle, so I’m guessing some of the other routes did too. Unfortunately I didn’t see the shuttle, so I don’t know if “C” was mentioned anywhere on the signage. The Route.C shuttle did say C shuttle and the destination. What’s the point of the 62 shuttle? It’s a long circulator that’s made up of other routes. 75 from Lake City to UW. The 65 and 75 are in the ESN and operating tomorrow. The 71 is cancelled so just call the 62 shuttle the 71 on reroute. If there is a lot of snow on the ground, and the bus is headed your way, take it. After paying your fare, sit or stand behind the driver (so that they have full visibility) and politely ask where the bus is going. This is all common sense and the sort of thing you would do years ago if it was the first time you took a bus. Kids these days, with their internets and smarty phones — so spoiled. Sorry. Duplicate post in wrong spot. Edit feature please! I was waiting at Broadway & East Union St yesterday at the metro stop and the route 90 just zipped by without stopping. What’s that all about? Speaking of the 90. On Metro’s ESN page where it talks about the 90, it says it only runs weekdays. But the 90 was running both Saturday, Sunday. Metro has yet to fix the snow route map for the 31/32 in Wallingford: the map says that they should be running on Stone Way between 35th and 45th, and use 45th to get to/from Wallingford, but they actually have been following their standard route. I complained to Metro, and all I got was the reroute PDF. I never got a response after complaining again. Maybe someone higher up in Metro is reading this and feels motivated to correct the record (and the map)? Despite this minor annoyance, I feel lucky to live within a few blocks of four routes that stayed running on the ESN. I’m so excited to be able to go home after work today. It’s been almost a week since I’ve last been in my apartment. On the bright side someone I interacted with on Twitter said they were organizing to put gondolas on the ballot in Sammamish and Newcastle. Which is ether the best news I’ve heard this week (ESN ending is second best) or a really specific and personal troll. Sooo…. When do the chains come off? Doesn’t seem safe to run commuter buses at 30mph when most traffic is doing 60-70 on dry pavement. The buses I saw yesterday didn’t have chains on. I was around Northgate, though, so it may vary depending on the route. The only vehicles with chains were City Light crews, the postal service, and the occasional driver who didn’t to want to take them off after getting on an arterial. Saw a bus heading up International Blvd going back to the base last night loose one of their chains.